Emissaries are secret agents charged with a special mission. Yes, they look like gnomes, or tomtar (in Swedish) but that’s only to fool you, to let down your guard. These Emissaries are on the roof, ready to spot trends, and find avenues for fun. I’m recruiting support for great teen and tween fiction, and inviting those who enjoy a bit of whimsy, and would like updates about the new website and insights about my path to publication. You’ll get to vote on the look and feel for articles and web pages, take crafts and ideas home to try with your families, submit ideas for articles, and receive special invitations to giveaways and promotions. The Emissaries provides a way to build my fan base and attention for announcements through grass-roots connections, sharing with friends when the website launches, if there’s a new video series they might enjoy, or more. I’m hoping that parents of kids I’ve spoken with, or older kids with their own accounts, will hop on and help with opinions, ideas, and more. Being part of a group where creativity abounds, you can contribute direct ideas and connect with other like-minded fans. The new website provides more than an author background, it’s got great resources for kids and adults alike. But I’ll be excited to get your ideas, too. Here’s a taste: for the kids: games, silly videos by my kids, book reviews they’ll love, gem mysteries, kids’ writing contests, articles about resilient kids, and more. For the adults: thoughts for resilient parenting, inspiring stories from contemporary authors, ideas for family outings, and places to talk about everything from bullying to helping your kids reach for their personal best. From time to time, there will be drawings for great giveaways for your families too. There will be even more once my book is on track for publication, and an inside scoop on the whole process. Plus the satisfaction of actually doing something more than wishing there was encouraging fiction for your kids to read by building your ideas into the movement too. How is it a movement? As a wildfire survivor and resilience expert, I’ve not only got fun stories on the way, but deeper meaning, too. Sometimes you might share issues you’re dealing with or wish someone would tackle. Sometimes it’s finding great resources for self-esteem and having more fun as a family. Resilience is a decision, not an accident, and I’ll be tossing out nuggets here to share and grow in your own life too. Be accepted into an exclusive group of fans. Tell people about the website and share with family and friends to help spread the word. Root for the books and purchase them when they release. Good wishes go a long way in this early stage! Use promotional materials and leave them at local bookstores, coffee shops, restaurants, dentists, anywhere you have permission and kids and parents congregate. Feature interviews, announcements, or anything else on your Facebook and other on-line connections. Visit me during guest blog posts or any online appearances or blog tours. Connect me with others who may be interested. Why Facebook, and should I join (if I’m not on there already)? Facebook groups are super ways to communicate with our group exclusively. I can easily forward links, upload updates, get your input on ideas, and you can also connect easily with others in the group if you want to. You can give minimal information and create an account, and I’d love for you to join us. I’ve participated in groups like this with other authors and it’s been so much fun. You get to really see “inside the curtain” and be part of their success, watching every step happen. You can also join my blog now (at the top) and you’ll receive posts until the new site goes live. Either way, I can’t wait to hear your feedback. 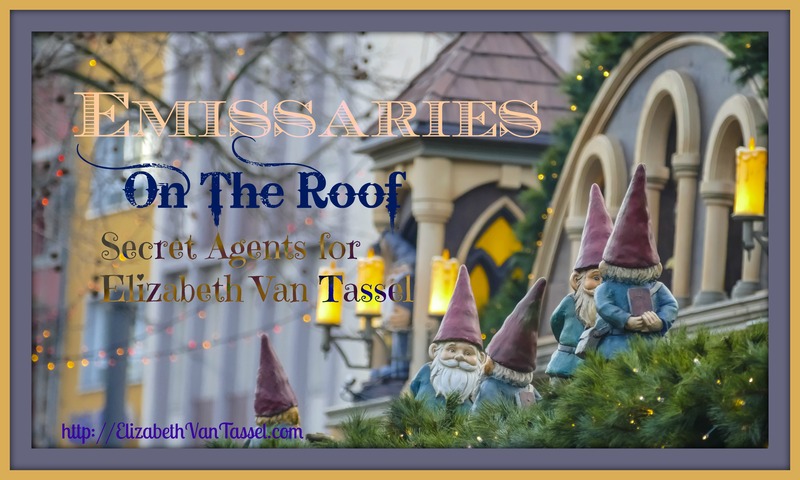 Join the team here: Emissaries On The Roof, Secret Agents for Elizabeth Van Tassel! Your encouragement means the world to me and I can’t wait to connect!